Hi Blues Fans. my name is Larry Watt and I am the owner/webmaster of BluesBox. 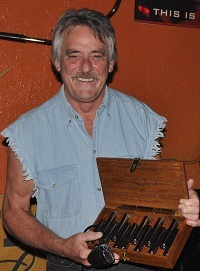 BluesBox Harmonica Cases which I manufactured (I'm holding one in the above photo). As the years went by I slowly discontinued making the cases, but kept this website up and running. and the rest of the family would pitch pennies and nickels on the table. There was always a lot of laughter, but for me it was serious business! The first song request and only request at that time was the tune "Music,Music"
Wish there was a video of that, but back in the early 1950's there were no Smartphones! So, thus the beginning of my career as a musician. rock, rhythm and blues bands. Then I "carried on" with life.